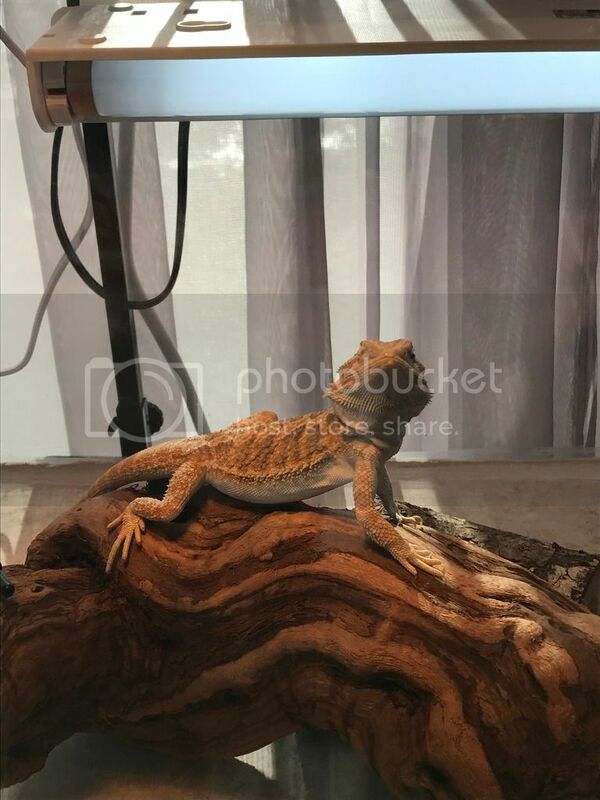 Mushu is home • Bearded Dragon . org . Yup, just as I suspected, he's already contemplating his demands, lol! OMG!! I love the look on his face. Looks great, very alert + healthy ! He is a good size, not over stuffed like some dragons are that become couch potatoes at 2 years old. Keep him strong, healthy + active by feeding him enough but not stuffing him. For reference- Skipper's average adult weight is around 560g. She does not look stuffed but has filled in fat pads and hips. She has been this way for years now. She gets bugs less often than most people reccomend, but has always been healthy (blood test confirmed). I would reccomend encouraging greens as often as you can. If you start early it makes for a very easy adult transition. But don't force her off bugs by any means at this young age. You made a good choice, he's young enough to seem like a baby but he's already a decent size and has a good temperament. Be sure to leave him bask whenever he has a larger meal, they need good heat to digest things properly. So the lady at store said he may not eat a lot today due to new environment which was true he didn't eat much. Couple greens that's it. Should he be better tomorrow eating?